Riding the Cockburn Ranges, Home Valley Station, The Kimberley. A place of soaring red cliffs, cavernous gorges and cascading waterfalls, The Kimberley is as captivating as it is wild, rugged and immense. Covering nearly 423,000 square kilometres of northwestern Australia, the region is five times the size of Tasmania. It’s also one of the most remote corners of the country, where you will encounter some of the most extraordinary outback adventures. Journey east from Broome – with its colourful history, landscape and perfect pearls – into cattle country. As the red sunset blazes against the Cockburn Ranges, it’s easy to see why this classic outback landscape was the inspiration for Baz Lurhmann’s epic film Australia. Rumble along the classic Gibb River Road in a four-wheel drive, stopping to marvel at thousand-year-old boab trees and the abstract shapes of termite mounds. Snorkel and dive in Rowley Shoals Marine Park or cruise in luxury through the Buccaneer Archipelago, home to the Horizontal Waterfalls and 1000 islands. Fly over the thundering Mitchell Falls or the Bungle Bungle Ranges in World Heritage-listed Purnululu National Park. Float along in a guided river cruise, spotting freshwater crocodiles and birdlife. Travel to hidden pockets of rainforest or places like the Berkeley River, where the only way in or out is by air or sea. And if lounging on a white-sand beach is more your style, follow the red-earthed road to Cape Leveque on the Dampier Peninsula, experiencing the indigenous culture of the Bardi people on beautiful, isolated coastline. Only accessible by air and sea, The Berkeley River Lodge is a destination in itself – a stunning wilderness on the Joseph Bonaparte Gulf on the northern Kimberley coast. 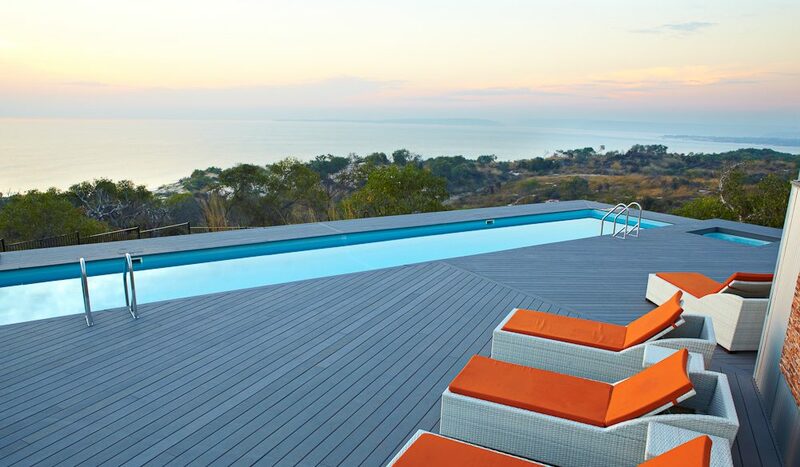 Go on a guided hike, picnic by a palm-fringed waterhole or hop aboard a fishing expedition. The creeks and coast are an angler’s dream, with species like mangrove jack, threadfin salmon and prized barramundi. Serious sports-fishing nuts can even splash out on a heli-fishing expedition, soaring to remote fishing spots aboard a True North chopper. Two Aboriginal communities, the Djarindjin and One Arm Point, live among the fire-red cliffs, squeaky-white sand and turquoise waters of the Dampier Peninsula. Staying at Kooljaman (Cape Leveque) camp, you can participate in small-scale cultural tours with the local Bardi community – spearing crustaceans, setting fish traps, sampling bush fruits and gaining an insight into bush medicine and the local way of life. Try your hand at making your own spear – or, if you’re game, spearing your own lunch. From Eco Beach Resort, just over an hour’s drive south of Broome, marvel at the white-sand beaches and crystal-clear waters of the Indian Ocean. Spot roos and wallabies munching on grass in the dunes, stroll the beach to see migratory birds or go on a humpback whale-watching expedition. Facing Roebuck Bay, this remote, peaceful location is so inviting, female flatback turtles come ashore to lay their eggs. Guests can even play a conservation role, monitoring nesting turtles. Dining with a view is one thing, flying to your meal is quite another. 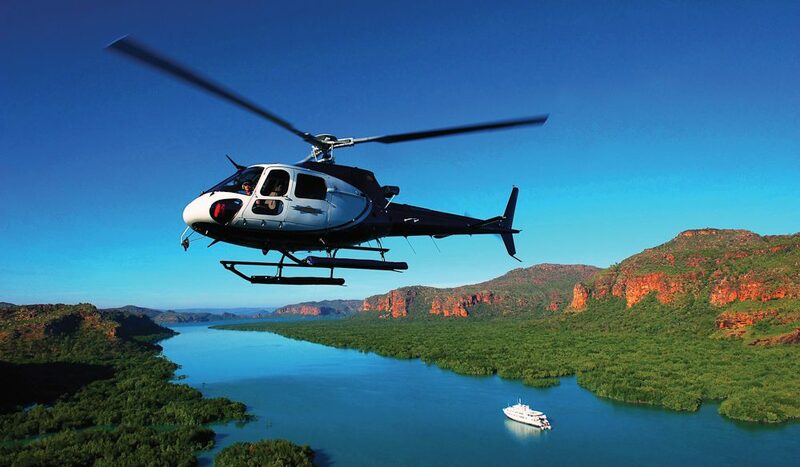 A heli-picnic to the summit of a thunderous waterfall is one of those only-in-the-Kimberley experiences. The pilot will take you to one of the many falls in the region, where you can have a refreshing dip and a feast far more extravagant than most picnic basket standards – think freshly caught reef fish, local king prawns and oysters. For less leg-wobbling heights, stay on board the True North for chef-led food expeditions like fishing for barra or mud-crab. northstarcruises.com.au; 09 91921 829. The dramatic landscape of the Cockburn Ranges are so classically Australian, Baz Lurhmann featured the scenery around Home Valley Station in his epic film Australia. 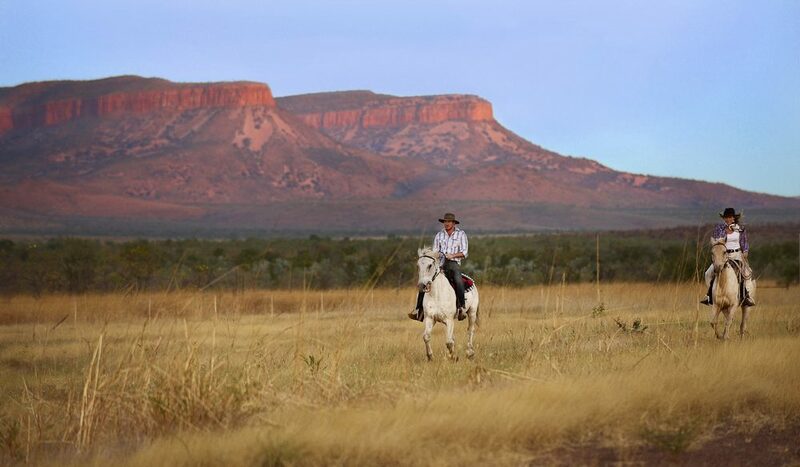 Stay at the working cattle station and let Aussie stockmen and women (Jackaroos and Jillaroos) teach you how to ride a horse, and gallop the wide, open plains, rocky ridge lines, billabongs and rivers. You can even take part in a traditional cattle muster. Film buffs can keep an eye out for Luhrmann’s Lookout, Jackman’s Jump Up and Kidman’s Crossing. A Spanish-sounding name in a truly Australian setting, El Questro Wilderness Park, near Kununurra in the east Kimberley, clings to a cliff, jutting out over the Chamberlain Gorge and river. The cattle station’s million-acre property has riverside camping grounds, bungalows and tented cabins, but the six exclusive, airconditioned suites perched above the gorge have wrap-around verandahs and bathtubs from which you can enjoy an uninterrupted vista across the rust-coloured Cockburn Ranges. 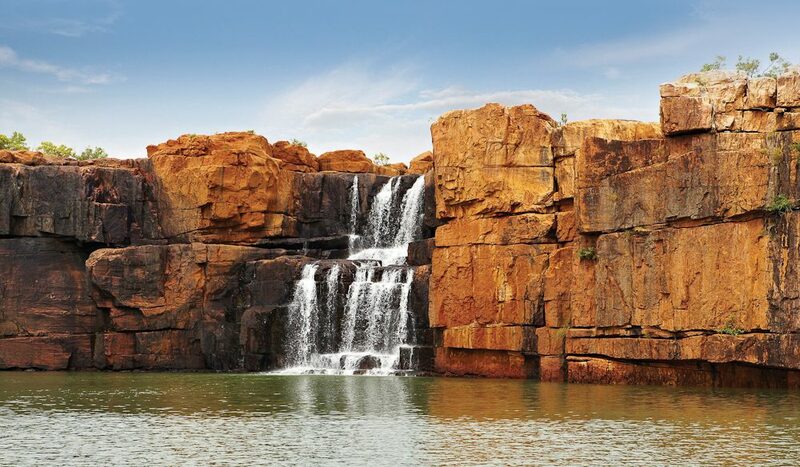 Sheer, rocky escarpments that plunge into rivers – the drama and grandeur of the Geike and Windjana Gorges, a signature landscape in The Kimberley, are best witnessed on a ranger-guided river cruise. Easily explored from Broome, reach the gorges on an overnight four-wheel drive tour, stopping to marvel at some of the other significant sights, such as a 1500-year-old boab tree. Stay the night on the banks of the Fitzroy River and explore Tunnel Creek, a 750-kilometre cave system carved through the Napier Range, the next day. See: Kimberley Wild; 1300 73 88 70. 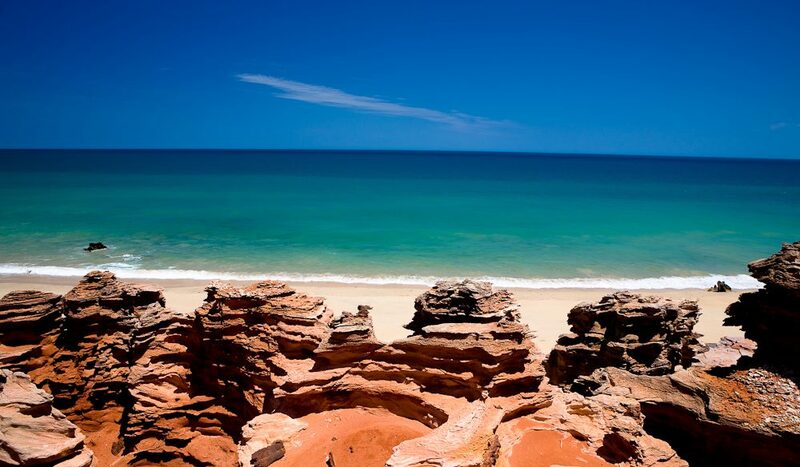 Getting there: Fly to Broome from Sydney and Perth. Indirect flights run from most cities outside of WA. Drivers head out on Derby Road and the unsealed Gibb River Road, or fly east to Kununurra. Flights from Darwin and Perth (three hours) also connect to Kununurra. A 4WD allows more freedom and flexibility to explore the Kimberley’s attractions. Eating there: It might be a far-flung corner of the country, but the culinary offerings are rich, particularly on luxury cruises. The region is flush with seafood – barramundi, oysters, prawns and mud crab are highlights. Kununurra has roadhouses, patisseries and riverside restaurants. Staying there: There’s a variety of accommodation from safari eco-tents, comfortable lodge rooms, caravan and camp-sites to luxury retreats in remote destinations. Cruises range from five-star (with their own helipad) to more modest, intimate vessels.